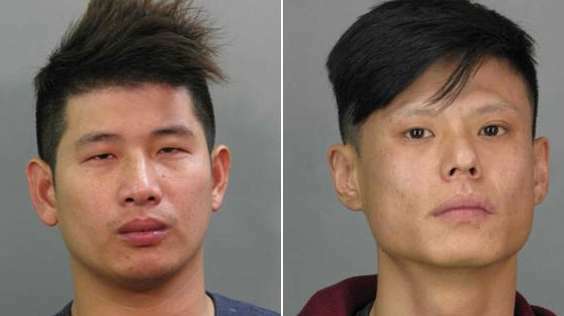 Two Flushing men were arrested Thursday and arraigned on grand larceny charges after, Nassau police said, they used re-encoded credit cards to make purchases at Macy's in Manhasset. Nassau Major Case Squad detectives said Zhaolong Wen, 25, of 120-11 28th Ave. and Jianhui Zhuo, 30, of 120-29 28th Ave. were arrested at Nassau County Court in Mineola while they were being arraigned in the court on unrelated charges. Police said the men bought items using re-encoded credit cards between Aug. 7 and Sept. 9, causing a loss of $60,000 to Citibank, $20,000 to Discover and $39,000 to Macy's. They were arraigned in First District Court in Hempstead on second- and third-degree grand larceny charges and are due back in court Monday, according to court records.